Being Filipino, it's natural that I love rice. It's a diet staple in Filipino cuisine and any meal involving rice is a comforting one in my book. Whether it's fried rice, chicken and rice or even rice noodles, all these dishes conjure up memories of my childhood. However I would never have thought South African dishes would have any similarities to foods I ate when I was younger. In our house, frying whole fish like tilapia was a weekly thing. Preparing fried fish even required my parents to set up a 'dirty kitchen' in the garage. A dirty kitchen is a cooking set up outside of the main house or in the very back of the main house. These are pretty common overseas, as my vacation home as one. But here in the United States, my parents set our dirty kitchen in the garage. (Our garage rarely housed a car, but rather served as a storage room of random pieces of furniture, shoes, car stuff, misc.) There, they would cook messy and foul smelling foods such as fish, dried meats, anything requiring frying where lots of oil splattering was expected. It was a nice set up so that the main house wouldn't smell of fish and the kitchen would remain grease splatter free. Whenever my mom made fried tilapia, we'd dig in and flake our fish, mixing it into garlic fried rice. For a special treat, we'd top it with a fried egg and add a splash of soy sauce and calamansi or lemon juice. That was how my mom got me to eat fish as a kid... no fish sticks for me, but a real whole fish at the table that we all flaked and mixed with rice. My friend Yumi prepared this dish for our South African wine dinner and when I saw it, I knew I would love it. 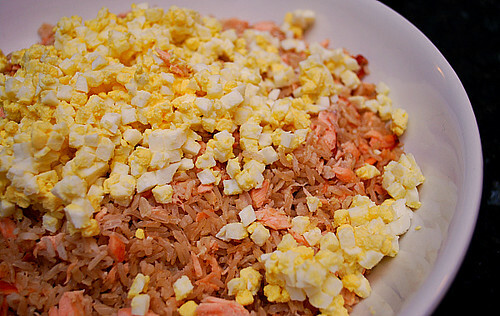 Flaked with bits of salmon and topped with finely chopped egg, this rice dish really took me back. I wouldn't have thought South Africans could relate to my fish, rice and eggs meal but this emphasizes how food really ties us all together. In a saucepan, heat the butter over medium heat. Add the fish and rice and stir gently to combine. Chop the egg whites and add to the pan, along with salt, pepper, and milk. Stir gently until heated through. To serve, garnish with egg yolks, passed through a fine wire sieve. hi J - looks like another fun and easy recipe. my mom's "dirty kitchen" is in our backyard patio! otherwise, my parents' house would be smelling like fish ALL the Time!